Château Troplong Mondot 1995, Saint-Emilion Grand Chu, France. We had not tasted the goodness that is fine bordeaux until treated at dinner tonight with our friends George and Angela. The four of us met at the Capital Grill for steak dinners and were not disappointed by any facet of our evening. All of us started with fantastic salads–three chopped wedges and me with a spinach and bacon salad that was perhaps the best of the bunch. Our main courses were nicely salted and perfectly cooked filets, strips, and the like. The photos shown here will definitely not do justice to the meal, which we accompanied with creamed corn and mashed potatoes. 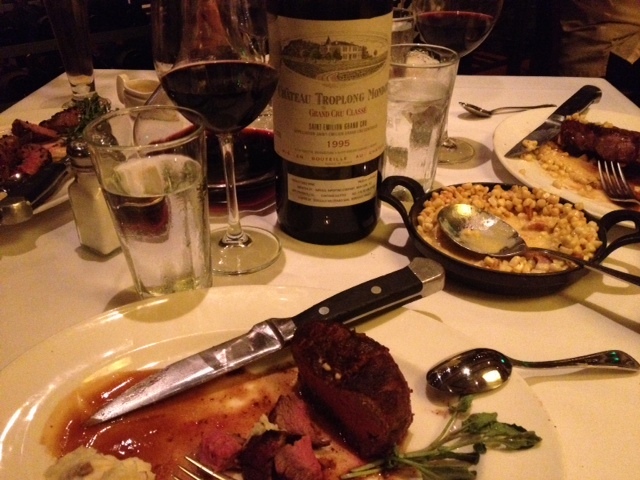 The most important accompaniment, of course, was the 1995 Château Troplong Mondot red to which George treated us. Deep aromas indeed. Really impressed that folks buy wines like this and can stand to hold them over time, when they’ll increase (not just in value but) in taste and in turn our appreciation. This entry was posted in Bordeaux and tagged France.